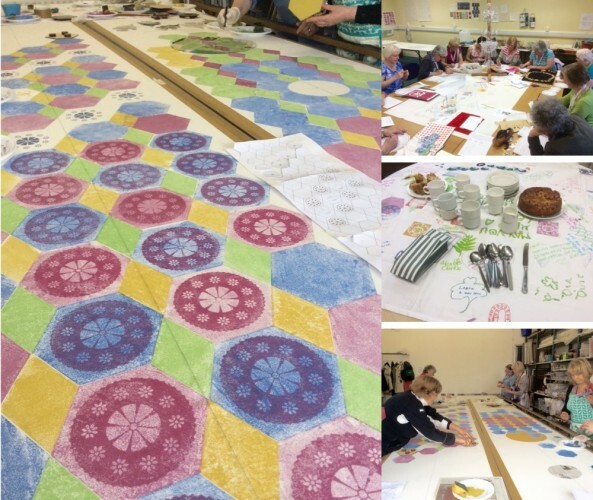 Wandering Methods is about taking time to explore a historic building and develop craft skills to make artworks inspired by memories, stories and architecture. Wandering Methods is a project developed in partnership by Bealtaine and Craftspace (Birmingham) in association with the Office of Public Works. Wandering Methods 2014 took place in Dublin Castle, where a small group of people worked with professional textile artist Liz Nilsson from March to May, drawing on the castle’s location, contents and archives as a mine for memories and stories. The group at Dublin Castle was a mix of previous participants of Wandering Methods projects and new people from the local area. Together, the group learned new craft skills, explored different approaches and invested time in collectively making something beautiful for the Bealtaine festival. They also worked with local designer Jenny Walsh to learn about designing crafted objects. The Dublin Castle group also worked in parallel, and exchanged ideas, with a group exploring Soho House Museum in Birmingham, the elegant Georgian home of the Industrial Revolution-era manufacturer Matthew Boulton. Both groups learned about a state-of-the-art digital fabrication lab in Falmouth University that can make copies of their objects. How high-tech is that! Participants in Wandering Methods often have no previous formal craft or art experience, and the focus is on collaborative learning that takes its time and enjoys the journey.